However, despite my distaste for doogh, eating yogurt with dinner seemed natural to me from a young age, and I developed a fondness for fermented and cultured dairy products. I’d fill up on appetizers or mezze plates of mast-o-musir, another Persian yogurt dip studded with shallots, opting to take it in with a spoon rather than with swaths of warm lavash. I’d greedily scrape off and eat most of the warm, funky, cheesy-tasting topping to the transcendent (yes, transcendent) kashk-e bademjan, a smooth yet hearty dip of eggplant and deeply caramelized onion or shallot that’s drizzled with kashk (essentially fermented whey). Fermented dairy has really become something of a fetish of mine. It doesn’t just fortify me; its silkiness, its coolness, and its richness activate a pleasure center. [ed note: After editing this post I realized how horrible it was to accidentally sexualize yogurt given its appearance, but I’m going to leave it for giggles.] I’ve seen friends or colleagues put their hands to their stomachs when I tell them how much yogurt I go through in a week. The fetish is mostly lost on those without a connection to the Middle East, though this is changing due to the ever-growing evidence of fermented dairy’s health benefits and popularity of Mediterranean and Middle Eastern food in this country. But when I was young, I was an anomaly. Labneh, or kefir cheese, is like the Cadillac of yogurt treats. Yogurt is strained until it’s ultrathick and has a spreadable cream cheese consistency. Just a tablespoon of labneh is dense in calories, fat, and protein—which is why it tastes so good. It has a character to its concentrated tang that most other cultured dairy products do not. 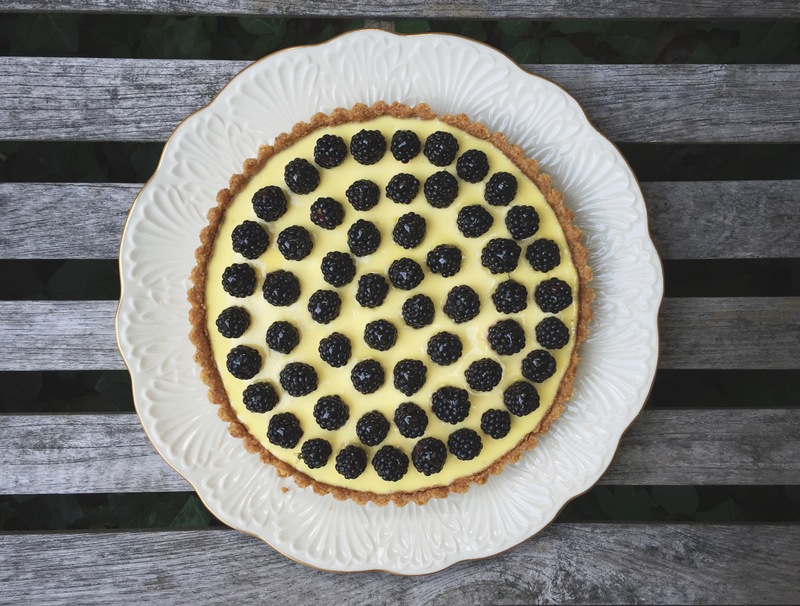 It’s a fabulous treat on its own, on crackers or vegetables, or preserved in olive oil; however, it makes for a tart filling that is really special. I’m certainly not the first one to come up with this idea: I love Alice Medrich’s labneh tart filling from Pure Dessert, and it was my jumping off point for this one. I’m sure her inspiration was cheesecake. 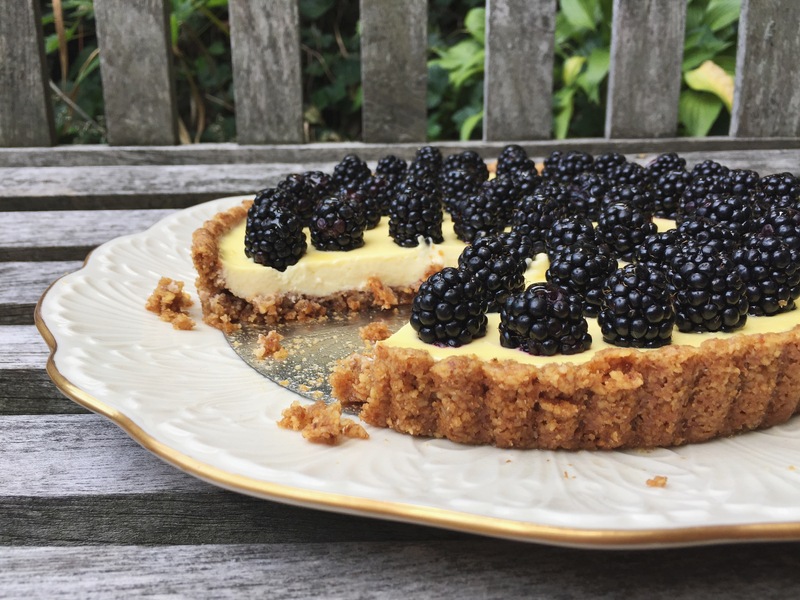 But in this version, I fill a slightly bitter walnut-and-oat crust, perfumed with just enough cardamom, with a tweaked filling and top it with earthy fresh blackberries—treasures that I’m still finding at the farmers’ markets around here. In this context, the silky-smooth filling creates an almost challenging flavor that’s not normally present in homebaked desserts. 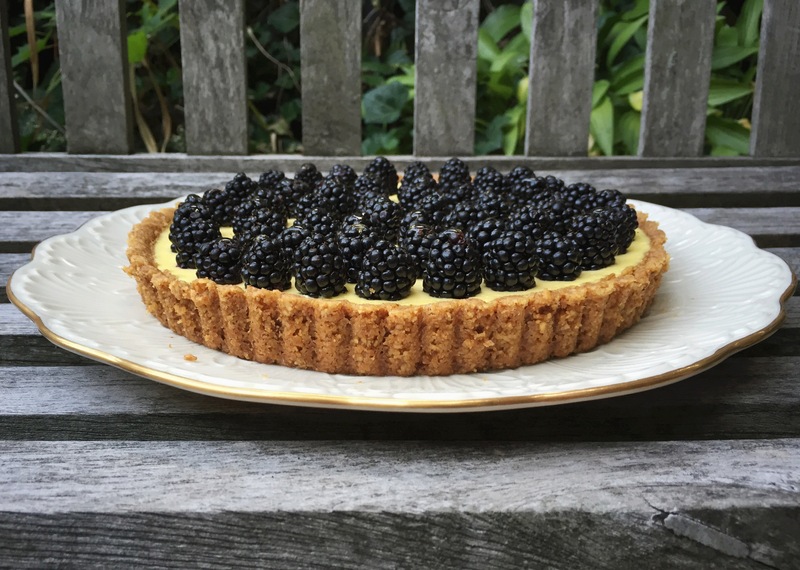 I’ve made this tart barely-sweet, as I’m wont to do. If you’d like, you can up the sugar in the filling to make the tart less tangy and more cheesecake-like in flavor, but this dessert isn’t about extravagance. It’s a cheese-filled custard filling, yet it remarkably feels light and lilting and most appropriate for a 90-degree day. It’s not dense, and its filling quivers seductively. I still eat yogurt everyday with dinner (full-fat and thick-strained). I enjoy farmers’ cheese and labneh, and drink kefir daily, simply because I think it tastes good. I use yogurt in any application where sour cream and mayonnaise are typical—not for the health benefits but for the flavor it provides—and like to find ways to let yogurt shine in dessert applications. Maybe it’s an effort to experience a culture to which I’ll only ever 50-percent belong, and in which, in these turbulent times, I may never geographically immerse myself. I won’t worry about philosophizing this one though; I’ll just eat. I like salty crusts, especially with nuts. But if you don’t want to notice the salt, go with 1/4 teaspoon. Labneh = lebni, labni, kefir cheese. 1. For the crust: Adjust oven rack to middle position and heat oven to 350 degrees. Brush inside of 9-inch tart pan with removable bottom with vegetable oil or spray with vegetable oil spray. 2. Grind oats in food processor to flour (alternatively, just use 50 grams of oat flour). Transfer oat flour to bowl. Pulse walnuts, sugar, salt, and cardamom until walnuts are finely ground. Add oat flour and pulse a couple of times to incorporate. Add butter and pulse until dough forms. 3. Transfer dough to prepared pan and spread evenly across bottom and up sides. Pop in freezer if it is too soft to handle at any time. 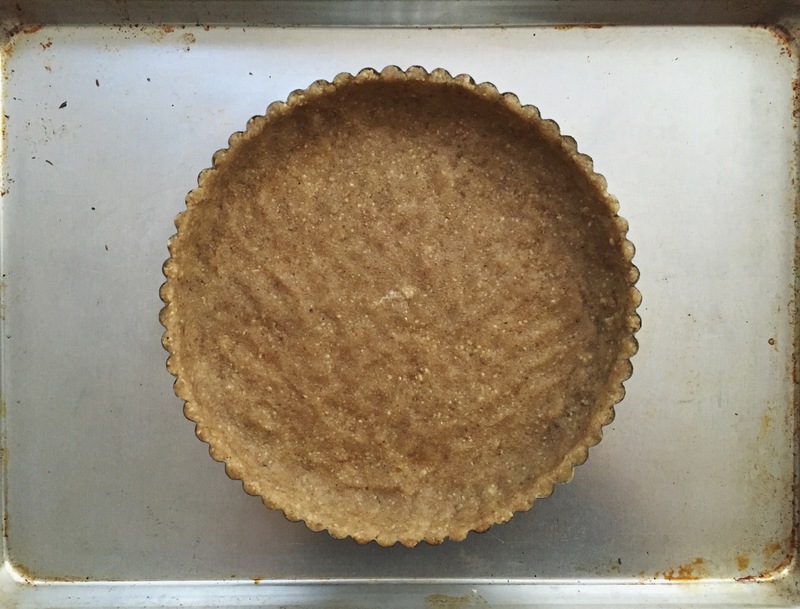 Freeze tart shell for 15 to 30 minutes. 4. Bake tart shell on baking sheet until uniformly golden brown and fragrant, 20 to 25 minutes, rotating baking sheet halfway through baking. Brush bottom and sides with egg white and return to oven for 1 minute or until set. Reduce oven temperature to 300 degrees. 5. For the filling: While tart is baking whisk eggs, sugar, vanilla, and salt together in large bowl until completely smooth. Whisk in labneh, trying not to incorporate air, until completely smooth. Transfer filling to warm crust and bake until edges are set but center still jiggles, 15 to 20 minutes. Transfer tart pan to wire rack and let cool for 1 hour. Arrange blackberries on top, pressing down lightly so they stick in place. If desired, stir honey and water in small saucepan over medium-low heat until combined and dab each blackberry with a little honey glaze. Let tart cool for 1 hour longer. 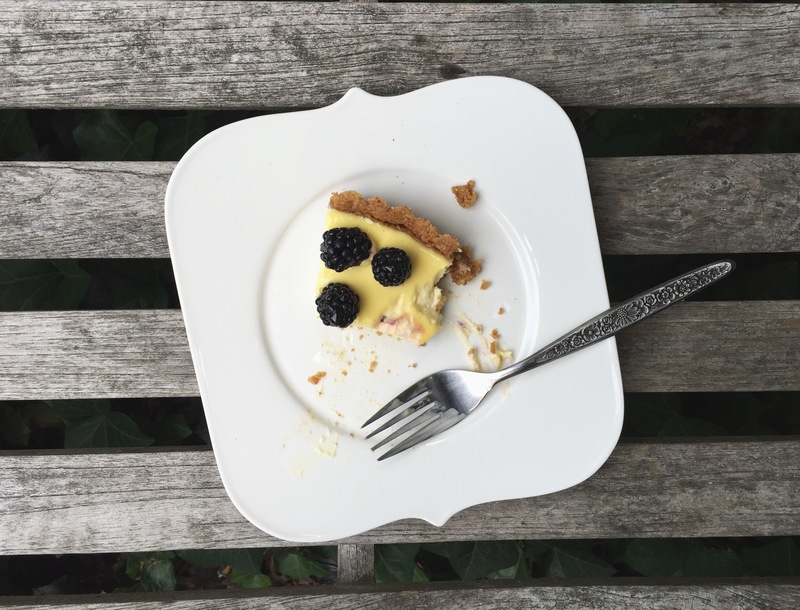 Slice tart and serve room temperature or transfer to refrigerator and slice within 6 hours. Your first experience with Doogh reminds me very much of my first experience watching my parents down Ayran, the Turkish carbonated yoghurt drink! (Had my first introduction to the thirst-quenching yoghurt drinks so perfect in hot water been a Mango Lassi I am sure I would have found it easier to get used to them!). 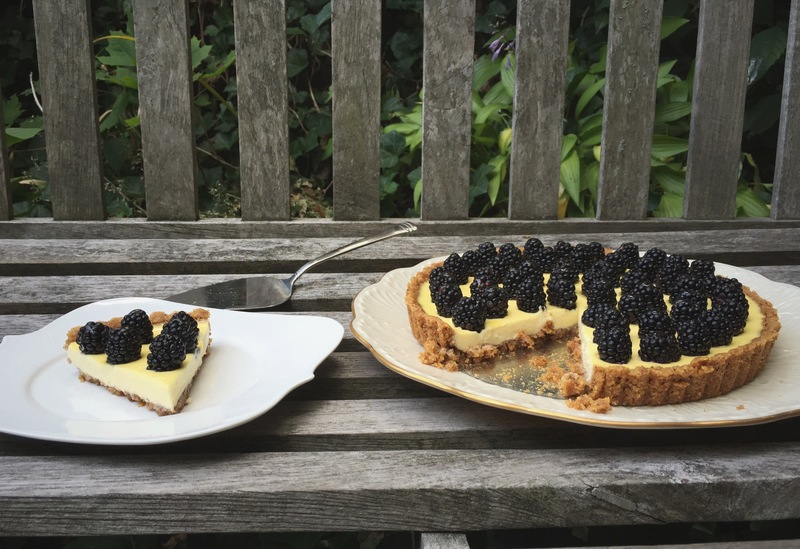 Love the sound of the tart – walnuts and cardamom are such a beautiful combination and labneh has been on my mind as a filling for a while too (no doubt after seeing that Alice Medrich recipe!). Yes, I’d never turn down a mango lassi! I certainly get my share of probiotics! Sounds like you do too :). I love that you grew up with such lovely and unique foods! Even if you didn’t appreciate them at a young age, which I didn’t either, you still learn from tasting and experiencing! A beautiful tart!!! I’m drooling. This looks incredible!